On 1 July 2011, voters in Morocco cast ballots in a constitutional-reform referendum that the government claimed drew a turnout of 73 percent and passed with a near-unanimous 98.5 percent majority. That such a turnout was abnormally high by international as well as Moroccan standards (1), that there is a history of rigged constitutional referendums in Morocco, that such exaggeratedly lopsided results are unknown in open and fair elections, and that holding a referendum a mere two weeks after announcing it is unusual (to say the least) by normal democratic standards seemed to trouble surprisingly few Western observers. Instead, the favorable press that had begun flowing even before King Mohammed VI gave his June 17 speech outlining the reform package continued to roll in. It received an assist from Beckerman, the New York public-relations firm that the Moroccan government retains to encourage upbeat stories about the country, but the basis for the positive ink was something deeper than standard-issue PR flackery and story placement. One might call this something the “relativity effect.” Since the beginning of the year, all the news from the Arab world had been about revolutions, strife in the streets, and bloody police or military onslaughts against peaceful protesters. By contrast, Morocco’s comparatively mild (albeit not quite nonviolent) management of its own protests seemed a model of reasonableness. Refusing to gun down demonstrators hardly makes a government democratic, but the media—perhaps eager for something different from the usual “autocratic Arab regimes behaving badly” stories—was nonetheless willing to run with the “Arab world’s shining democratic exception” narrative. In truth, the official Moroccan reaction to the upheavals that began in Tunisia in December 2010 was not only fairly restrained (though there were beatings and three protesters were killed), but also remarkably well managed. On 9 March 2011, not long after Ben Ali and Mubarak went down and less than three weeks after the first protesters appeared on Moroccan streets, King Mohammed gave a rare televised address. In it, he dramatically promised “comprehensive constitutional change” featuring “the rule of law,” an “independent judiciary,” and an “elected government that reflects the will of the people, through the ballot box.” This was in truth a clever preemptive move, designed more to break the protests’ momentum than to bring genuine change. The composition of the constitutional-reform commission that the king appointed the next day spoke volumes. It consisted of eighteen civil servants and was headed by a constitutional-law professor with a history of condoning autocracy (2). Still, the draft that this body produced might have featured bolder reforms if the protest movement (known as Feb20 after the day on which demonstrations began) had mustered enough savvy to keep the pressure on. Instead, the young Facebook activists who were calling the shots continued to rely solely on popular fervor, as if that would last forever. Crippled by inexperience as well as internal conflicts between Islamists and leftists, Feb20 failed to produce key leaders, central structures, or much of an agenda beyond “Down with absolutism!” sloganeering. With nothing but a single unstable asset—mass enthusiasm—the protest movement lost momentum and petered out even as the regime was maneuvering effectively to counter it. The monarchy, meanwhile, played skillfully for time. It allowed street demonstrations to go unchallenged (and collected favorable Western media notices for its tolerance) from their inception in late February until the activists’ numbers began to dwindle in May—at which point the police became more active with their truncheons. By the end of May, dozens of protesters had been injured and one had died. Then the Interior Ministry began to mobilize counterdemonstrators. Unlike the nonviolent Feb20 people, these proregime thugs showed up armed with stones and clubs, openly spoiling for fights while the police looked the other way. On June 17, as tension was peaking, the king spoke again on television to introduce the draft constitution and announce the July 1 referendum. The rush to a vote was obviously meant to take full advantage of the monarchy’s new momentum by leaving opponents almost no time to organize. The campaign period was outrageously dominated by the regime and its mouthpieces. State-controlled television stations and mosques sang the new constitution’s praises. On election day itself, reports of fraud came from virtually every corner of the Kingdom. As videos posted online showed officials rummaging in open ballot boxes, scores of voters testified that no identity checks had been performed at polling stations, thus enabling widespread ballot-stuffing. To veteran observers of Moroccan politics, the lopsided official results announced that night came as no surprise. Yet in spite of all this, it is fair to acknowledge that Moroccan officials worked hard to back up their case for the new basic law. Despite the hasty referendum and its embarrassingly hard-to-credit result, the constitution does appear to offer some support to those who would like to see it as a silver lining to these unseemly events. Yet closer scrutiny dims the luster. From the outset of the reform movement’s demonstrations, its top demand had been the creation of a “parliamentary monarchy.” The crowds had also called for the “separation of powers” and “accountability by those in charge.” All three of these can be found in the new basic law’s first article, which defines the very foundations of the Kingdom’s regime. As for the king himself, he made a pair of highly regarded moves by abandoning his constitutional “sacredness” and binding himself to choose a prime minister exclusively from the ranks of the party that wins legislative elections. The prime minister, in turn, enjoys new constitutional powers. Finally, the new constitution severs all ties between judges and the Justice Ministry, and solemnly declares that judicial power is independent of executive power. At first glance, these look like major concessions. The king may not have abandoned all his powers, but he seems to have curtailed a significant part of them. More decisively, the new constitution seems to subject executive authority to the broad standards of human rights and, if not democracy, at least fairly balanced power sharing. Hence, Morocco may well be, after all, the “Arab exception” that the international media are so eager to commend. Let us be clear: All the foregoing provisions are indeed found in the new constitution, and Morocco is a place where the constitution matters and is taken seriously by all. But here is the tricky—and yes, possibly the exceptional—thing about Morocco: Nothing is quite what it seems. Whoever does a closer reading of the new document, or takes the trouble to consider its articles in relation with one another, or views the whole text in light of other legal texts and the larger political, economic, and social context of the country will understand how misleading appearances are. Morocco’s monarchy has made some concessions, but they are less than meets the eye, and autocratic features remain. The current king’s father, Hassan II, ruled for 38 years (1961–99), and during that time made deception an art of the state. In a freshly decolonized Third World where one-party systems were the norm, he made sure that Morocco’s 1962 Constitution enshrined multipartism. Yet his concern was less to foster democracy than to set up a divideand-rule dynamic. He created puppet parties (complete with election results rigged in their favor) to counter those who might dare to dispute royal supremacy, and secured the election of charismatic oppositionists for their public-relations value as members of parliament. Even while engaging in such stratagems, he always insisted that he was a neutral arbiter above the political fray. Anyone who complained too long or too loudly about his Machiavellian duplicity risked jail, torture, or—in rare cases—assassination. Like many of his counterparts in the Third World—and all his Arab peers—King Hassan could have skipped the illusion game altogether and held himself up as an enlightened despot from whom almost everything proceeded. But he was a despot of another kind—the kind who enjoys praise and recognition abroad as much as absolute power at home. Consequently, he devoted as much time and energy to burnishing his image as a wise, democracy-friendly statesman as he did to maintaining his iron grip on Morocco. To that end, the country’s key institutions and laws (and above all its constitution) were carefully engineered to give the appearance of relative openness while remaining flawed enough in substance to leave plenty of room for corruption and autocratic dirigisme. Thus when it comes to marketing itself, however spuriously, as a poster child for democratic aspirations, the Moroccan monarchy has longstanding expertise—certainly more than any other regime in the Arab world has ever developed. It comes as no surprise, then, to find that the Kingdom’s new constitution may look generally liberal but in fact maintains and even strengthens the forces of absolutism and oligarchy. 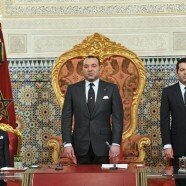 Faithful to its irreversible choice to build a democratic State based on the rule of law, the Kingdom of Morocco resolutely continues the process of consolidating and reinforcing the institutions of a modern State, the fundamentals of which are the principles of participation, pluralism and good governance (3). It goes on like that for pages, with little that is concrete but much that is glowing and high-sounding, as if the goal were to please everyone (liberals, Muslim conservatives, Western opinion leaders) by name-checking every possible reference (human rights, Islamic law, international conventions, and the like). As a Moroccan proverb goes, “A tongue has no bone,” meaning roughly, “You can twist it as much as you want” (or in other words: talk is cheap, and words can be used with little regard for their real implications). Another proverb, this one in English, says that one cannot have one’s cake and eat it too. Yet Morocco’s monarchy is trying hard. Whether out of conviction or a desire to look good in the concert of nations, the government has over the years ratified scores of international human rights accords. As it happens, some of these (including the International Covenant on Civil and Political Rights, or ICCPR) grant freedoms (such as those of thought, conscience, religious opinion, and religious practice) that are intrinsically denied by certain pieces of national legislation (such as the Penal Code, which basically subjects the spiritual, social, and sexual lives of Moroccans to Islam) (4). By affirming in the constitution’s Preamble that “duly ratified international conventions” will be accorded “primacy over the internal law of the country,” the monarchy seems courageously to bind itself to respect human rights, to the detriment of its Islamic power base. Regime apologists have made much of this, but wait: The same passage puts matters in a different light by also declaring that this primacy is to be accorded only “within the framework of the dispositions of the Constitution and laws of the Kingdom, in respect of its immutable national identity” (namely, Islam). If you think it through, having “primacy” over a thing (Moroccan law) only “within the framework” set by this same thing makes no sense. As if the constitution’s authors had a feeling that not everyone would be fooled, they closed by stating the Kingdom’s commitment “to harmonize in consequence the pertinent dispositions of its national legislation.” Who shall decide which laws are “pertinent” when it comes to meeting international human-rights standards? The constitution does not say. And at any rate, Morocco ratified the ICCPR way back in 1979, but has yet to “harmonize” anything. Perhaps the first thing to come in for harmonization should be the constitution’s Arabic and French versions. On at least one crucial matter, they differ. This is the question of the king’s “sacredness.” The official line is that this antiquated feature has been abandoned for the sake of modernization. Yet that is far from clear, and may depend on whether you read the constitution from the standpoint of a cosmopolitan, Frenchspeaking opinion leader, or from that of the average, Arabic-speaking Moroccan. The article that previously stated (in both languages) “The person of the King is inviolable and sacred” now states two different things depending on the language used. In French, Article 46 of the new basic law reads: “La personne du Roi est inviolable, et respect Lui est dû (The King’s person is inviolable, and respect is owed to Him). But in Arabic, it reads: “The King’s person is inviolable, and ihtiram [respect] and tawqeer are owed to him.” (5) Ihtiram wa tawqeer is an ancient expression used to signify the privileged status of those who claim descent from Muhammad himself—a group that includes the members of Morocco’s 350-year-old Alaouite dynasty. Though dictionary definitions of tawqeer vary, the most commonly found are “reverence,” “veneration,” “adoration,” and “obeisance.” Some thesauruses also propose “augustness,” “exaltation,” and “glorification.” To be fair, “respect” can be found among the alternate translations, but if tawqeer is simply meant as another word for ihtiram, one wonders what they are doing in the same sentence. More important, why would one of them—the bolder and more dramatic—be quietly left out when the Western public is watching? Has Morocco’s king really renounced his “sacred” character—no trivial thing in a country where many superstitiously worship “saints” and “descendants of the Prophet”—or has he merely rephrased it, resorting to an ancient formula that stems from deeply archaic roots? What then of “modernization”? As if to underline the relevance of these questions, on 30 July 2011, a month after the purportedly sacredness-free constitution was adopted, the annual allegiance ceremony went forward as it has for many years (6). The king sat mounted on a thoroughbred before the royal palace in the city of Tétouan. Thousands of white-clad local officials bowed to him, as servants wearing red shashia caps (the traditional headgear of slaves) shouted “Our Lord bestows his blessing on you!” Then the entire cabinet and general staff lined up to kiss His Majesty’s hand as television cameras beamed the scene live to every corner of the Kingdom. Versions of this pharaonic performance are repeated regularly throughout the year at various royal reviews and ribbon-cuttings, complete with adoring crowds, bowing servants, and hand-kissing officials, all united in devotion to a monarch blessed with divine potency. Who shall tell the average Moroccan that his sovereign is not sacred anymore? Looking beyond the palace to other institutions is no more encouraging. Morocco has a Parliament elected by the people, but the king can still block any law he dislikes. He alone convenes, presides over, and sets the agenda for the Council of Ministers—a body whose approval is needed before Parliament can even consider a bill. Also, he alone appoints and dismisses the secretary-general of the government, an official who can block laws at any stage (including after Parliament approves them) by subjecting them to a “review” process that many bills have entered but never left. Add to this that Article 42 gives the king the personal privilege of issuing laws by royal decree—which is in fact how most laws get made (7). To see free and fair legislative elections (which Morocco indeed has) as the most important element in this picture would be misleading, to say the least. Competitive elections for Parliament are doubtless a fine thing, but if the legislature thus chosen cannot do its job, what is the point of such voting except perhaps to provide democratic window dressing? To grasp the futility of elections, one needs only to note how Moroccan politicians behave. In a nepotistic system where the king hires and fires cabinet ministers at will regardless of electoral outcomes, the key to a successful career is not democratic electioneering, but forelock tugging courtiership. Most politicians have long known that “reaching consensus with” (that is, knuckling under to) the palace is the only way (8). This attitude came close to the point of absurdity when top elected politicians, provided by the seismic events of 2011 with an opportunity to constitutionally empower themselves in relation to the monarchy, let the chance slip through their fingers for fear that they might offend the king (9). And yet perhaps this cautious attitude was not such an absurdity: Morocco’s fragmented partisan landscape (34 parties) and biased redistricting and eligibility thresholds combine in such a way that no party can end up with more than about a fourth of the seats in Parliament—not enough to challenge the palace. Freedom at the polls coexists with a structurally rigged electoral system. When we take that rigging into account, we can see that there is no point in making much of the new constitution’s Article 47, which compels the king to pick the prime minister from the party that “ranks first” in legislative elections. As long as the electoral law encourages partisan balkanization, ranking first will mean little. The premier going into the 25 November 2011 elections, Abbas el Fassi, came from the “first-ranking” party (Istiqlal, which held just 16 percent of Parliament) when the king appointed him after the 2007 elections. His government was a coalition of seven parties whose only common value was a shared subservience to the royal palace—and consequently, a readiness to flip against the prime minister whenever the king snapped his fingers. Under such a system, the political parties (including the one “ranked first”) have no choice but to do what the palace wants or be shoved aside. In the 2011 elections, as it turned out, the Islamist formation known as the Party for Justice and Development (PJD) won an unprecedented 27 percent of the seats—nearly double the number that the Istiqlal incumbents were able to garner. This outcome seems all the more remarkable given the palace’s enduring wariness toward Islamists. Although PJD leader Abdelilah Benkirane may enjoy more popular legitimacy than his predecessor could claim, it will not make the new premier any less a constitutional hostage of the monarchy. Although much remains uncertain so soon after the elections, it seems likely that significant parts of the remaining 73 percent of Parliament will refuse to cooperate smoothly with the PJD. Indeed, in all probability the Benkirane cabinet will have to wage an exhausting, never-ending guerrilla-style battle on all institutional fronts against both the royal palace and its political minions. Benkirane holds a fresh title (“Chief of Government” or CoG) under the new constitution but has no real additional room for maneuver. Indeed, whatever his office is now called, he remains bound hand and foot to the royal palace. The king continues to appoint and dismiss ministers at will. The CoG is allowed to “propose” ministers for nomination or, in a new wrinkle, to “require” that a minister be dismissed—but the king is not bound to go along, and retains the last word in both cases. Moreover, the king can still reshuffle the cabinet whenever he pleases. The constitution now says that he is to “consult” the CoG, but again, that official’s opinion is not binding on the palace. As regards the CoG’s powers, the new constitution offers striking examples of doubletalk. Article 92, for instance, brands the Council of Government, a cabinet meeting over which the CoG presides, as an important tool for managing public affairs. Yet nothing discussed there can be settled without a green light from the Council of Ministers, which is also a meeting of the cabinet, but this time called at the king’s initiative and with him in the presider’s chair. Moreover, the Council of Ministers has prerogatives under Article 49 that far outweigh those of the Council of Government, including the right to appoint governors, ambassadors, the central-bank chairman, high security officials, and “executives of strategic public enterprises and establishments.” Article 91 states that the CoG has appointment powers as regards the civil service and senior public-enterprise positions, but then qualifies this by saying that these powers are “without prejudice to the stipulations of article 49 of the present Consitution”—an article that of course leaves the CoG nothing serious. Likewise, Article 98 says that the government exerts executive power “under the authority of the Chief of Government,” but what can this mean given that executive power is also exerted—and more decisively—under the authority of the king? This kind of verbiage is merely a smokescreen, intended to give regime apologists a basis for hyping the CoG’s supposed importance. In reality, the only powers that the CoG has are those which the palace chooses to bestow upon him, period. Many in the Western media brought up the CoG’s new privilege of dissolving Parliament under Article 104. This article is probably the strangest of all. It reads: “The Chief of Government can dissolve the Chamber of Representatives, by decree taken in the Council of Ministers, after having consulted the King.” What on earth does that mean? Can anything be issued in a council over which the king presides merely by consulting him (that is, without needing his consent)? Even assuming the question makes sense, it is at present technically impossible to answer it since none of the Council of Ministers’ procedural rules has ever been made public. The overwhelming likelihood, of course, is that no such rule—one that would let the ministers issue decrees without royal consent—exists or ever has existed. Thus what Article 104 really means is that the king, who already has the power to dissolve Parliament by direct decree under Article 51, can also (if he finds it convenient, as well he might in some cases) do so indirectly by making the Chief of Government take responsibility for this grave act. Here we see the new constitution in all its devious, two-faced brilliance. It offers a handy hook (“The elected Chief of Government has a major new power!”) for purposes of pushing the “Morocco as aspiring democracy” narrative. Yet in fact this new power is actually a liability for the CoG and another asset potentially of use in the fine-tuning of royal supremacy. In truth, the only “new power” of the CoG pertains not to any constitutional innovation, but to Benkirane’s personality. If the king bullies him by leaning too heavily on his constitutional privileges, the new CoG could well decide to resign in protest—a move that none of his predecessors would have ever considered. By all accounts, political suicide is the only option left for a Morrocan premier to demonstrate his independence vis-à-vis the palace. Who Will Guarantee the Guarantor? What needs to be noted here is that the justice minister, while he may have exercised day-to-day control over the CSM, was in fact only its vice-president. Its president was—and still is—the king. Moreover, Article 115 of the new constitution gives the king power to name half the CSM’s members, a bump up from the previous figure of 40 percent. Article 107 adds that “[t]he king is the guarantor of the judicial power’s independence.” And yet, one wonders: Quis custodiet ipsos custodes? The traffic in influence and privileges, the abuse of dominant position and monopoly, and all other practices contrary to the principles of free competition and fair dealing in economic relations, are punished by the law. This sounds wonderful until one asks what law is supposed to do the punishing, and discovers that no such law exists. For a clue as to the reason behind its absence, one should consider that King Mohammed is Morocco’s biggest banker, farmer, grocer, and landowner, and controls the country’s markets for such staples as milk, sugar, and yogurt. Through Copropar, a mutual fund that includes nine dummy companies (the bestknown of which is called Siger—“regis” or king spelled backward), the royal family owns Morocco’s largest conglomerate, the SNI group, whose revenues have at times totaled as much as 8 percent of annual GDP. King Hassan acquired the SNI group, but it is fair to say that when it comes to business, the son surpasses the father. King Mohammed’s right hand and wheel horse is Mounir Majidi, who is both his private secretary and Siger’s CEO. Between 1999 and 2009, the royal group’s profits skyrocketed, and dividends paid to the royal family increased sevenfold. This much is known because the royal companies had to keep transparent financial records in order to comply with the rules of the Casablanca Stock Exchange. But such transparency is over now. Ending transparency (and the distasteful press coverage that it spawned) might have been a core reason behind Morocco’s biggest ever buyout: In 2010, Siger and its eight sister companies bought around US$1 billion of their own group’s shares in order to exit the stock market. What will happen next is shrouded in mystery, though such a heavy investment in opacity seems unlikely to presage an era of fair and ethical business practices. Morocco’s major investment decisions are effectively made by 3 individuals: Fouad Ali El Himma [a former interior minister and schoolmate of the king’s], Mounir Majidi [Siger’s CEO], and the King himself. To have discussions with anyone else would be a waste of time. Seen from afar, Morocco’s constitution looks fairly democratic and compares favorably to others around the Arab world. But those who take a closer look can see that behind the elaborate democratic veneer lies an archaic and corrupt absolute monarchy. It is a regime under which the three fundamental powers of government—executive, legislative, and judicial—are subjected to the will of one man; where this man’s cronies act as puppetmasters of the political system and ransack the economy; and where those who dare to speak out against abuses are promptly crushed. During the early 2000s, Morocco had a press that was free enough and felt confident enough to act like a real fourth estate. Media coverage shined a light into some of the royal regime’s less seemly corners, offering among other things detailed reports (complete with hard numbers) on the king’s business dealings. The palace struck back with police seizures and crooked trials of journalists. Yet there was always a backlash from Western watchdog groups that could and did mount widely publicized protests. So the monarchy switched tactics and began bleeding troublesome press outlets dry through comprehensive commercial embargos. The royal secretariat’s economic leverage within Morocco is immense, and its quiet campaign to deny advertising revenue to independent newspapers was a success. Within a few years, critical papers had either toned themselves down or gone bankrupt—and it was all perfectly legal. So here Morocco stands today: The monarchy enjoys renewed legitimacy after a massive popular vote in favor of a cleverly packaged and sold but still resolutely absolutist constitution; the royal regime’s relative handful of critics have been either silenced or marginalized; and Western governments and media organs are applauding or even (in the case of France) tossing bouquets (10). The legislative elections of November 2011 changed nothing—the king and his entourage retain absolute dominance in every field of public life. Some would argue that the new constitution, though biased and tricky, provides at least some breathing room for democracy advocates, who can try to take its more liberal stipulations at face value and leverage them to demand deeper reforms. Yet exerting leverage requires not only a lever, but a solid place on which to stand and rest a fulcrum. Morocco today, sadly, offers no such firm ground. Since the Parliament, the judiciary, and the press are toothless, street protests are the only method left for pressuring the monarchy from inside the country. If a moment like the one that gave rise to the Feb20 movement ever comes around again, its leaders will have to show greater acuity and presence of mind than their predecessors did, and keep the momentum going with better organization and better strategic choices. The Moroccan population is as young as in the other countries in the region, with one-third of the population between 15 and 29 years old and higher levels of youth unemployment than in Tunisia or Egypt. According to a government report published in 2006, Morocco needed to double the number of new jobs it created each year from 200,000 to 400,000 in order to deal with the country’s deficit in terms of human development. With almost three times as many people entering the job market each year as there are jobs created, the pressures. . . are huge: one in four graduates does not have a job (12). It is no coincidence that the strongest nonideological pressure group in Morocco is the “unemployed graduates” who often stage dramatic protests (including attempted self-immolations) in front of Parliament. The palace sees the dangers of popular anger, and rushes to head it off when it flares—not only with promises of political reform but also with huge spending. Recently, the minimum salary has been hiked 15 percent; more than 3,400 “unemployed graduates” have received civil-service jobs; and public employees have raked in the highest raise in Moroccan history (up to 35 percent in some cases). The state’s Equalization Fund, whose mission is to hold down the prices of consumer staples (and with them, political discontent), has seen its budget nearly triple. According to Moroccan economist Fouad Abdelmoumni, such gigantic spending is unsustainable in the medium term, because of the country’s structural lack of competitiveness (13). Morocco is not oil-rich, and its economy still heavily relies on volatile sources such as money transfers from emigrés, foreign investment, and tourism—all of which have been in deep recession since the global financial crisis of 2008. Today, the Kingdom can still finance its deficit by recourse to international lenders, but the latters’ conditions are growing ever more stringent. Soon they will require budget cuts that may be drastic enough to touch off another round of popular fury. By laying down an elaborate constitutional smokescreen, the monarchy may have outfoxed its opponents. Yet its victory is likely to prove short-lived. A strong-enough wind will disperse any smokescreen. In 2011, a high wind blowing in from elsewhere in the region swept the country before turning into a soft breeze. The next time, the wind may come from within Morocco’s borders, and a struggling economy plus a lack of democratic political outlets may intensify its effects. From whatever quarter this wind arises, moreover, it will likely find embers still hot enough to be stirred again to flame. The upheavals of 2011, whatever may have been their problems and however uncertain may be their effects, have shown that time is not on the side of the Arab world’s autocracies. However smart its leaders may be, Morocco’s autocracy is no exception. This essay was originally published in The Journal Of Democracy, Volume 23, January 2012. Le mélange de ces deux écrans de fumées m’a donné l’idée d’en tiré un exemple signifiant (j’éspére) – comme nos parents faisait de nous apprendre le calcule en utilisant des bonbons ou des fruits- en traduisant l’image politique avec une logique footballistique. Bien sûr sans oublier que cet entraineur est le patron des forces de sécurité du match, le vendeur des tickets, le vendeur des produits alimentaires, le divin coordinateur des supporters, c’est lui qui distribue des fumigènes pour créer des écrans de fumée aux tribunes, c’est lui qu’aux vestiaires donne des consignes a ses joueurs pour casser les jambes de leurs adversaires, mais c’est lui également qui vient devant les supporters pour aider le joueur adversaire dont la jambe avait été cassée à se lever sous une pluie d’applaudissements de partout …et la liste ne parviendra jamais à l’exhaustivité. Voila le terrain dans lequel les activistes marocains jouent en tant qu’équipe visiteuse mais que peuvent-ils faire entre l’agressivité des joueurs locaux, la malhonnêteté de l’arbitre, et l’inutilité du gardien, et la pluie des bouteilles qui leurs viennent des supporters hypnotisés par des fausses victoires mais aussi de leurs supporters entre lesquelles l’effet hypnotiseur ne cesse de propager le tout petit nombre qui a resté et qui n’a pas été affecté par l’hypnose est désormais -comme la totalité des supporters- tout à fais aveugle à cause des écrans de fumées engendrés par les fumigènes, ce n’est pas étonnant de voire les forces de sécurité du terrain en repos à raison que la victoire que l’entraineur essaie d’arracher à « Damas stadium » par les flingues on créant une grande polémique au monde, a « Rabat stadium » ils l’ont eu silencieusement et subtilement par les fumigènes et l’hypnose en recueillant même des félicitations occidentales, un terrain ou le fait d’être voyant et non-hypnotisé pourrait te couté cher puisque tu seras rejeté et puni par tes co-supporters qui te prendrons comme un cas pervers mais si tu n’accepte pas suivre leur univers parallèle, les sécurités du terrains te jetterons dans un trou-noire que tu en sortiras jamais. M. Benchemsi le père de la presse libre au Maroc en attendant la sortie de votre ouvrage dans l’espoir qu’il ne soit pas interdit au Maroc, je vous présente avec toute ma reconnaissance, mes remerciements sincères pour votre travail.